Western. 01 Nigel's Choice. Spaghetti Western. Cult. Drama. Revolution. Classics. Leftie Flicks. Gangster/Mob. Robberies Burglaries Heists. Desert. Guns. Recommended. 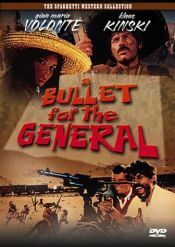 The first and best of the Italian "Mexi-Westerns", on a par with Leone's and with a haunting soundtrack. An American mercenary teams up with a bandit on the fringes of the revolutionaries in order to assinate their leader. A violent political film from the same pen as The Battle Of Algiers.